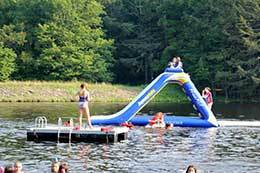 Camp Netimus, a residential summer camp for girls, located in the Pocono Mountains of Northeastern Pennsylvania, is home to 145 sleep away campers and more than 80 staff members who come from across the United States and from countries around the world. Our summer camp for Girls was founded in 1930 and continues to provide an exciting and enriching summer camp experience for girls ages 7-16. Campers can enjoy a variety of over 40 activities such as horseback riding, swimming, rock climbing, hiking, boating, canoeing, water skiing, sailing, mountain biking, tennis, photography, and crafts to name a few. Camp Netimus has been a sleep-away camp for girls since 1930, and has helped thousands of girls have the summer camp experience of their life. If you are looking for a Summer Camp for Girls, where you can grow and have fun while building confidence, character, and lifelong relationships, Camp Netimus a Summer Camp for Girls is your premiere choice. If you are looking for a Summer Camp for Girls for your daughter, Camp Netimus, an award winning Girls Sleep Away Camp is only a phone call away. Please Contact Us and call 570-296-6131 or email Darlene@netimus.com for session availability, further information OR to schedule a tour of our sleep away camp for girls in Pennsylvania or to schedule a home visit. to schedule a camp tour or home visit. Camp Netimus, a Summer Camp for Girls was founded as an all-girls residential camp in 1930. Our goal at Camp Netimus is for every camper to have a happy and..
We have a variety of session lengths and dates available to meet any need. Registration is quick and easy. Come be a part of our family. We have a space for you!!! 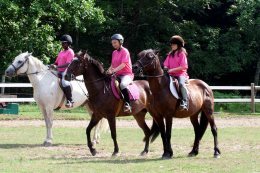 Camp Netimus for Girls has an established horseback riding program.. The “Green” Department at Camp Netimus emphasizes all things relating..
Our Performing Arts Department helps girls gain confidence..
Instruction in the following activities is provided..
“Keep yourself afloat!” – instruction for all six..
“Cut and paste!” – this includes a wide range of activities..
“Bulls eye!” – campers use a bow and arrow to shoot at straw targets..
Camp Netimus has an extensive trip program. Participation is voluntary..